French painter and engraver. He was one of the most important artists to emerge from Franois Devosge s school of art in Dijon. His reputation, like that of his fellow Dijonnais artist Pierre-Paul Prud hon, is based on a number of Neo-classical works of a pleasingly poetic character, which Devosge had encouraged. 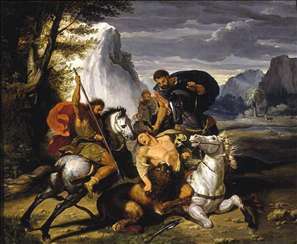 In 1776 he became the first artist from the Dijon art school to win the Prix de Rome with his painting of an uplifting moral subject, Manius Curius Dentatus Refusing the Presents of the Samnites (Nancy, Muse des Beaux-Arts). The Dijon academy was very quickly recognized as one of the most important outside Paris. As a student there Gagneraux was directed towards examples from antiquity, the Italian Renaissance and the work of Poussin. During his four-year study period in Rome (1779-81) he worked on a copy (Dijon, Palais Justice) of Raphael s School of Athens (Rome, Vatican, Stanze Raffaello) to fulfil his obligation to the States of Burgundy which sponsored him. He spent most of his life in Italy, working in the company of Anton Raphael Mengs, Johan Tobias Sergel and Henry Fuseli in the 1770s and with Antonio Canova, Gavin Hamilton, Goethe and Jacques-Louis David in the 1780s. In 1784 he was recognized as an artist of exceptional talent by Gustav III of Sweden, who visited Gagneraux s studio and bought the large painting Blind Oedipus Commending his Family to the Gods (Stockholm, Nationalmuseum). This subject, which was subsequently taken up by many painters, was unusual for its time. David, however, had produced Blind Belisarius Begging for Alms (Lille, Muse des Beaux-Arts) in 1781, which was similar in subject, sentiment and style. In common with contemporary history painters in Paris, Gagneraux showed an interest in dramatic subjects, clear and legible gestures and expressions and stark, austere settings. Oedipus was a turning-point in his career. As a direct consequence of the picture s success, he began to receive commissions from the King of Sweden and members of the court circle. One of the first of these was for a group portrait commemorating the meeting between Gustav III and Pope Pius VI in the Vatican (Stockholm, Nationalmuseum). It was completed in 1785 and a copy (Prague, National Gallery), commissioned by the Pope, was done in 1786. It displayed Gagneraux s competence as a portrait painter and his ability to mass a large group on a grand scale. He took certain liberties with the architecture in an attempt to idealize it and with the positions of the main figures, which imitated those of the most revered antique statues shown in the background. This imaginative reconstruction of a solemn occasion, in which there was no attempt at absolute historical accuracy, was characteristic of Gagneraux s approach. See more details about "Lion Hunt"